I had considered hiring a personal trainer for several months. My knees were constantly sore and despite attending bootcamp classes twice a week and a Boxercise class once a week I was struggling to lose weight and tone up. I think initially my impression of a personal trainer had been influenced by programs like ‘The Biggest Loser’, so I was expecting somebody to be barking orders at me and pushing me to the point where I collapsed. The reality of working with Sam is that while he pushes me and I feel challenged in every session, I never get to the point where I want to give up. The focus is on performing the exercises with perfect technique and improving week on week rather than working to the point where you drop. 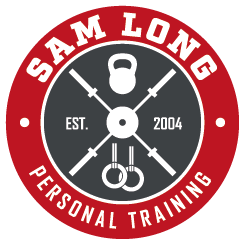 Sam: A big part of hiring a trainer is to push you to do more than you would probably do if you were training alone, that being said, the purpose of training is to make you better. If your joints are constantly aching and you’re peeling yourself off the floor at the end of every session it’s time to take a closer look at your approach. When I first signed up to trained with Sam my initial expectation was to have somebody to design a workout for me specific to my goals and to have him coach me through the program on a weekly basis. Whilst Sam delivered this, I also learnt the importance of correct nutrition and also how things like stress and sleep influence my results. I think initially I probably thought that hiring a trainer would automatically guarantee I got results however I have learnt that is not the case, the way I see it now is that Sam provides me with the map but for me to achieve my goals but I need to put the work in outside of our sessions by eating correctly, getting adequate sleep and managing my stress levels in order for me to get to where I want to be. Sam: This is such a common misconception! It doesn’t matter how good your training program is, if you don’t put the effort in both in and outside of your training sessions you will be disappointed with the results. Having trained consistently for a number of years I struggled got justify the cost of a personal trainer, at the time I thought they were more for people who didn’t know what they were doing. I had seem Sam training clients in the gym, and one day got in to a conversation about deadlifts. I knew this was a good exercise to include in my workouts but my lower back always ached the next day. After a quick assessment we established that because of the amount of time I spent working at a desk and driving the muscles in my hips and legs were extremely tight which meant I struggled to get in the right position to perform the exercise correctly. Rather then cutting out the exercise all together, he showed me a way to elevate the bar a few inches off the floor which made it easier for me to maintain good posture and as a result massively reduced the amount of pain I was in the next day after deadlifting. I now see Sam once a month for a new program. I use an app to track my workouts so he is able to keep tabs on my progress without me having to see him in person. For me this works perfectly and is money very well spent. Sam: My opinion is that everybody can benefit from coaching, every olympic athlete and high level performer has a coach and I pay for coaching in various aspects of my life. That’s not to say that everybody needs or can afford 1-1 training which is why I’ve done my best to have options to suit almost every budget. I first started training with Sam when approximately 4 years ago. I was 30kg overweight after the birth of my daughter and struggled to fit in to my size 18 clothes. I felt like I had tried everything and had a mountain to climb. I contacted Sam after a recommendation from a friend but I was nervous to get started and sceptical as to whether I had enough time to fit in an exercise routine around being a new mum. Sam came up with a plan of training me initially at home 3 times a week so I would not need to arrange a babysitter. Within 2 months I had dropped 2 dress sizes and was feeling so much happier with how I looked. When my daughter was a little older it was easier for me to arrange a babysitter so we moved my training to the gym where we had access to more equipment. I am now a comfortable size 10 and happy with my body. The focus is now on maintaining my body shape whilst getting stronger and fitter. Sam: Don’t be fooled into thinking that you need to spend hours in the gym and follow a massively restrictive with your diet in order to get results. Often focussing on doing the basics correctly and consistently will get you a long way… Start by focussing on the ONE thing you can do better right now which will be a step in the right direction of achieving your goals. Depending on what stage you’re at now that could be aiming to walk 10,000 steps a day or swapping a sugary drink for a sugar free one to adding some interval training to your program or making sure you get 1gram of protein per pound of bodyweight every day. My experience of Personal Training in the past was somebody who stood on a treadmill for 30mins and told me all of her problems while I paid for the privilege, so after that experience I was quite hesitant to invest in Personal Training again. I chatted to Sam in the gym for a while before I finally signed up for some sessions. One of the first things I learnt is the importance of finding a form of exercise that you enjoy as well as doing what you need do to get results. I don’t think I’ve every spent more than 5minutes on a piece of cardio equipment when I’ve trained with Sam, the sessions are constantly varied and I would genuinely say I have fun whilst I train. Sam: 1st off if your trainer is earning his money by standing on a piece of cardio equipment chatting to you then he needs shooting… Secondly, for you to get good results you need to find a way of making exercise a regular part of your lifestyle. Realistically, if you get no enjoyment from your exercise program you’re never going to stick to it long enough for you to really see the benefits, so find something you enjoy whether it be bodyweight training, kettlebell training, rock climbing. Yes certain exercise types are more beneficial than others but ultimately it’s the exercise type that you will stick to doing long term which will reward you with the best results.